Have you ever closed your eyes and opened book of poetry or philosophy, self growth or spirituality to a page that was so apropos of what you were personally experiencing? “That is so random”! my daughter would say. But is it, I wonder? Try this your self. Write down a issue you’d like guidance on. Pose your request in a manner that will elicit more than a yes or no answer like; ” Please give me insight about…” Close your eyes and ask the question. Flip through the book open and read. What did you discover? I like to do this with inspirational card decks too. Here is a recent story and example of synchronicity and support from the mind below the surface. A while ago I was interviewed on “Good Vibrations”, a public radio show. 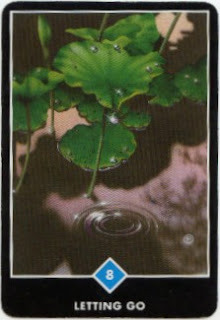 (KXRA 540 AM) Right before I went on the air, the co-host asked if I wanted to draw a card from the Osho Zen Tarot deck and see what message it had to offer. I held the deck in my hands, closed my eyes, and shuffled through the pile until one card felt right. I picked and passed it back, face down. The co-host looked at it and chuckled. “You are going to laugh when you find out what card you drew” she said. You pulled the card titled, “Letting Go”. The reason it was funny is because during the briefing before the show, minutes before I drew this card, we had a few minutes to catch up and talk about our personal lives. I remember saying, “This is a time where I feel like I am being pushed to let go on many levels. I am trying to release the parental hold I have held diligently, now that my son is seventeen. This by no means is coming easily. Having faith and trusting that he will drive carefully, remain out of harm’s way, and continue to thrive, whether he eats enough vegetables and fruit in a day, are all part of the letting go process”. I spoke about re-defining my role in his life and separating myself from the emotional attachment and ego identity of being his overseer. “I am also thinking about different career moves, including re-entering the public sector, writing and publishing” I said. The current economic situation has challenged us all to think creatively about alternative ways to make a living. We only had a few minutes to talk about the meaning of this card. We focused on the symbolism of the card’s imagery. It shows a droplet falling off of a lotus leaf into a pool of water. The co-host said “We are the droplets merging into a larger body of water. The challenge is to let go of our ego and individual identity in a sense, and realize we are all one and the same”. #8 … WATER In this image of lotus leaves in the early morning, we can see in the rippling of the water that one drop has just fallen. It is precious moment, and one that is full of poignancy. In surrendering to gravity and slipping off the leaf, the drop loses its previous identity and joins the vastness of the water below. We can imagine that it must have trembled before it fell, just on the edge between the known and the unknowable. To choose this card is recognition that something is finished, something is completing. Whatever it is – a job, a relationship, a home you have loved, anything that might have helped you to define who you are – it is time to let go of it, allowing any sadness but not trying to hold on. Something greater is awaiting you; new dimensions are there to be discovered. You are past the point of no return now, and gravity is doing its work. Go with it – it represents liberation. In existence there is nobody who is superior and nobody who is inferior. The blade of grass and the great star are absolutely equal … But man wants to be higher that others, he wants to conquer nature; hence he has to fight continuously. All complexity arises out of this fight. The innocent person is one who has renounced fighting; who is no longer interest in being higher, who is no longer interested in performing, in proving that he is someone special; who has become like a rose flower or like a dewdrop on the lotus leaf; who has become part of this infinity; who has melted, merged and become one with the ocean and is just a wave; who has no idea of the ‘I’. The disappearance of the ‘I’ is innocence.